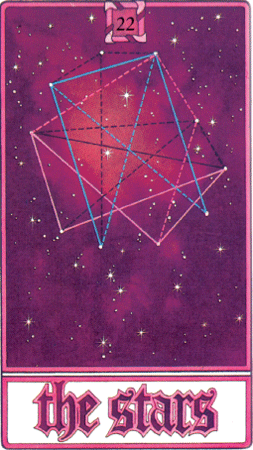 The Stars Card tells us what we do on earth is linked to what is in the heavens and the implication for us is threefold. The card is about destiny and can reinforce the Fortune Card. Our stars incline or pre-dispose at birth. Along with our genes and our social backgrounds we have characters. We are given certain cards to play, but it is up to us to play them. So the message of the card is to be ambitious for yourself. You may be made for better things in your career or your personal life. Are you being too small minded about your potential? Lastly the card is suggesting we find another perspective to our lives. In many of the situations we find ourselves in we need to distance ourselves from the everyday. Our concerns are painful, and we can ease the pain by seeing them in a different context.